Wolves are voracious carnivores and in some cases, have shown to drastically reduce ungulate populations. The gray wolf (Canis lupus), also known as the timber wolf, prefers the open tundra and forests of British Columbia. Although they once inhabited most of North America, distribution now occurs in only Alaska, Canada, and parts of the U.S.A. In general appearance, the species resembles a large domestic dog, but has longer legs, larger feet, a narrower chest, and a straight tail. The fur is thick, with an outer layer composed of coarse guard hairs, below which a soft undercoat is present. The coat undergoes an annual moult in late spring, with a short summer coat growing simultaneously, which continues to develop into a winter coat in the autumn and winter. The most common coat colour is gray flecked with black, with lighter underparts, but individuals and populations also occur that are red, brown, black, or almost pure white. The gray wolf’s sensitive ears and nose help it to track down prey, while the long legs enable it to make high-speed, lengthy pursuits. Wolves are voracious carnivores and in some cases, have shown to drastically reduce ungulate populations. Wolves prey on moose, caribou, sheep, deer, beaver, goat, and elk. Some studies have estimated that each wolf will kill nine moose per year. Gray wolves are social animals, living and hunting in packs of 2-12. A typical pack is composed of an alpha male and an alpha female (the pack leaders), their pups, and several subordinate or juvenile wolves. 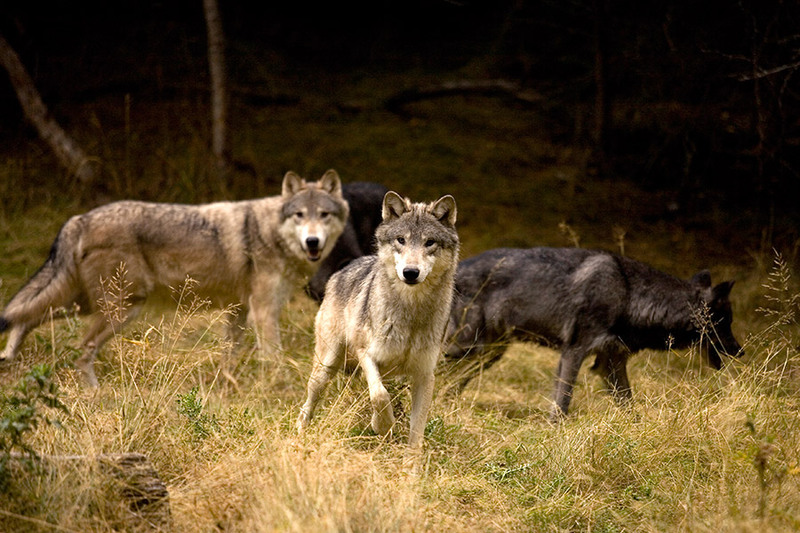 The pack members exhibit close relationships and communicate with each other with a range of sounds including barks, whines, growls, and howls. Gray wolves are the largest of all canines. At 60-90 cm (2-3 ft.) at the shoulder and 1.5 m (4.5-6.5 ft.) in length, gray wolves vary in weight from 25-60 kg (55-130 lb.) In general, gray wolves’ size and weight increase the further north they reside.